Doomsayers and Chicken Little-types can now strike "deathray from a star" from their list of possible ways to die. A new study finds that the chances of a gamma ray burst going off in our galaxy and destroying life on Earth are comfortingly close to zero. 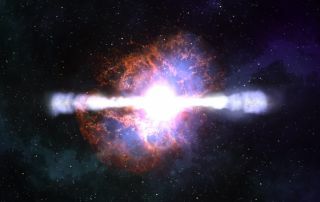 Gamma ray bursts, or GRBs, are focused beams of gamma radiation emitted from the magnetic poles of black holes formed during the collapse of ancient, behemoth stars. They can also form when dead neutron stars merge with each other or with black holes. It's been speculated that if a GRB went off near our solar system, and one of the beams hit Earth, it could set off a global mass extinction. But in a new study to be published in the Astrophysical Journal, researchers found that GRBs tend to occur in small, metal-poor galaxies and estimated that the likelihood of one occurring in our own metal-rich Milky Way is less than 0.15 percent. "There are a lot of people who have wondered whether GRBs could be blamed for mass extinctions early in Earth's history, and our work suggests that is not the case," said study team member Krzysztof Stanek from Ohio State University. GRBs can last anywhere from a few milliseconds to several minutes and are one of the brightest, and potentially the most deadly phenomena in the universe. So powerful are these events that some scientists have speculated they could help explain the so-called Fermi Paradox: If the universe is teaming with advanced alien civilizations as some theories predict, then why have we never found any traces of them? One answer could be that events like GRBs turn galaxies into giant autoclaves that sterilize life forms on planets before they have can develop interstellar travel. Some scientists think that such an event might have already occurred in our own galaxy. Trigger for a mass extinction? Last year, scientists from NASA and the University of Kansas speculated that a GRB might have triggered the Ordovician-Silurian extinction 450 million years ago, one of the five worst extinction events in our planet's history. A computer model found that if a GRB were to strike Earth for even 10 seconds, it would deplete up to half of the atmosphere's protective ozone layer and blanket the planet in a thick, brown smog of nitrogen dioxide, a poisonous compound found in air pollution. The model estimated that recovery from such an event would require at least five years, during which time ultraviolet radiation from the Sun could kill off microorganisms and disrupt the food chains of animals around the world. But in their study, Stanek and colleagues found that GRBs tend to occur in small, deformed galaxies that are poor in elements heavier than hydrogen and helium. Our Milky Way, in contrast, is a large spiral galaxy rich in heavy elements. Therefore, the chances of a GRB occurring within our galaxy are extremely unlikely, the researchers say. It's thought that stars with low metallicity are less likely to lose mass as they burn and are thus more massive and rotate faster when they die. The more massive a star is, the more likely it is to form black holes--one suspected GRB source--and rapid spin is believed to be crucial for powering the burst. "All models for gamma ray bursts these days require rapid spin," said supernova and GRB expert Standford Woosley from the University of California, Santa Cruz who was not involved in the study. "Rotational energy is essentially where the energy for the burst comes from," Woosley told SPACE.com. In the new study, the researchers compared the properties of four galaxies where GRBs had been detected with other galaxies recorded in the Sloan Digital Sky Survey. They found that of the four galaxies, the one with the most metals--and therefore most similar to ours--had only a 0.15 percent chance of hosting a GRB. Since the Milky Way's metal content is twice as high as that galaxy, its odds of hosting a GRB would be even lower. Also, not only are GRBs unlikely to strike Earth, they are unlikely to strike any planet where life could develop, Stanek said in a telephone interview. Planets need metals to form, so a low-metal galaxy--while more likely to have GRBs--will have fewer planets and fewer chances for life. Woosley said that while he thinks it's unlikely a GRB will form in our galaxy, he wouldn't rule out the chances of such an event just yet. "There still may be channels of binary evolution that give the necessary rapid rotation to the star when it dies," he said.